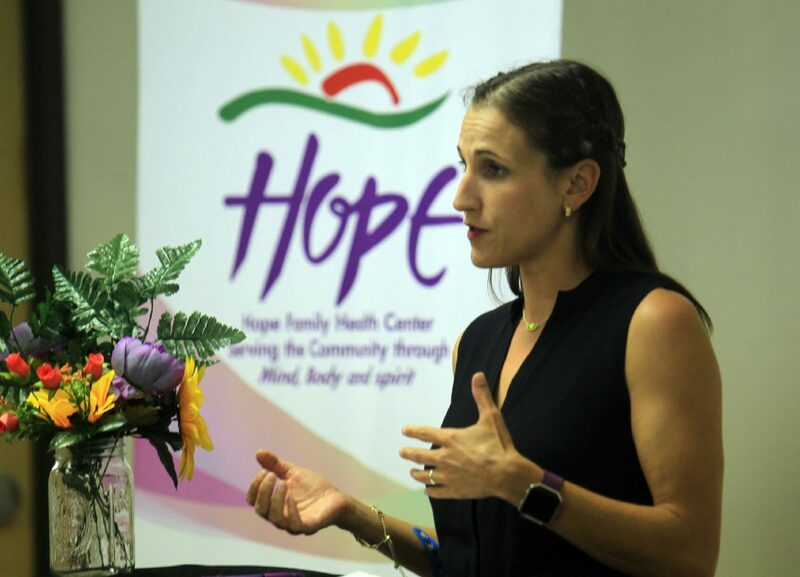 Rebecca Stocker, executive Director, speaks during an announcement of The Warn Line, a peer support initiative/service, at Hope Family Health Center on Wednesday, August 8, 2018, in McAllen. McALLEN — Elsa Roman’s outlook on life changed from negative to positive within a span of a couple of years. It was two years ago that Roman, an Hidalgo resident, was at her lowest point in life with financial issues, birth of a child and her father in dire health. Today she is a certified peer support specialist coordinator at Hope Family Health Center. “I was suffering from depression, very hard depression and I asked for services and was sent to counseling where I was diagnosed with a mental health illness,” Roman said. She was a patient in the center for more than a year and with the assistance of the center and doctors orders was released. After the discharge, Roman returned — this time as a volunteer and became a leader for laughter yoga. She is now on a mission to help others as a peer specialist. Executive Director Rebecca Stocker said Hope Family Health Center has helped approximately 2,000 patients a year in the center’s 22 years. The center provides services in primary medical, counseling, integrated behavioral health, peer support services, case management, and wellness programs to the uninsured living in the Rio Grande Valley. The center will begin a new service in October called, “Warm Line,” which is still in the developmental stages. The idea began last year after a staff discussion and having the peer group ongoing for four years. When Texas House Bill 13 was in legislation, the center applied for the grant and was awarded funding. HB 13 is a grant program for mental health services that passed in 2017. The program is for the community to provide services and treatment to individuals experiencing mental illness. The beginning stages of the Warm Line program will be conducted through over-the-phone conversations, but as time progresses she wants to find other ways of communication like text messaging.